The Great Recession has been reshaping America into a renter nation. And increasingly, highly paid, highly educated households are making room for themselves in it. That’s according to a new report by the NYU Furman Center, which examines rental housing trends between 2006 and 2015 in metros with more than a million residents. Here’s the upshot: rich households—those earning more than 120 percent of the metro median income—saw their renter share rise by 1.2 percent between 2012 and 2015. Since 2006, that growth was a striking 6.2 percent. The renter share among households making less than 50 percent of the median income, on the other hand, remained roughly the same since 2012. Since 2006, it grew by a modest 2.9 percent. More educated subsets of metro residents also gained renters in this period. What these numbers ultimately show is that contrary to convention, renting is gaining popularity among people who are seemingly well-positioned to buy a home. “We’re seeing a shift in the composition of renter households in the nation’s large metro areas,” Sewin Chan, an associate professor of public policy at NYU Wagner and co-author of the report, said in a statement. This pivot away from homeownership, especially among educated, high-earning millennial households, has a number of explanations. Younger folks may value the flexibility renting offers; they can easily move cities, add or subtract roommates (or partners), and save on maintenance. Some households may also be wary of the risks of homeownership—especially if they came of age during the housing crisis. Plus, even if they’re getting hefty paychecks, paying off student debt may be a higher priority for some young people than scraping together enough for a mammoth down payment. As a result, the share of homeowners had declined, while the share of renters has risen across the U.S. in the last decade. In the 53 metros analyzed, renters made up 40 percent of the residents in 2015, but that share varies considerably by metro. In L.A., they made up more than half; in Salt Lake City, they only made up a third. But putting off homeownership means that high-income households are adding to growing demand for rentals—especially in the most-sought after metros. The result? 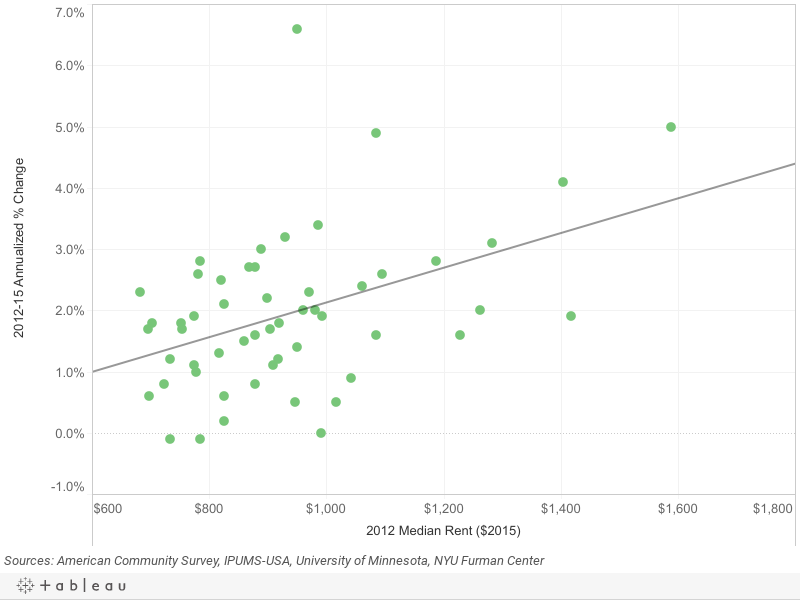 Rents that are already too damn high are climbing higher. The NYU Furman Center report finds that between 2012 and 2015, rents rose in most of the 53 metros analyzed—and faster in already-hot markets like San Francisco and San Jose. Denver, which saw the highest increase at 6.6 percent was an exception in that it wasn’t super expensive to begin with. As more high-income renters enter a tight rental market, more landlords tend to jack up the price they charge for units that have recently opened up. If you moved within the last year, you were likely paying more for your apartment, the NYU report found. This rent premium on recently-available apartments was higher in the hottest markets. In San Jose, for example, two-bedroom apartments that recently opened up were a striking 33 percent more expensive than two-bedroom units in general. Two metros—Minneapolis and Grand Rapids—bucked this trend, with discounts for newly available apartments.